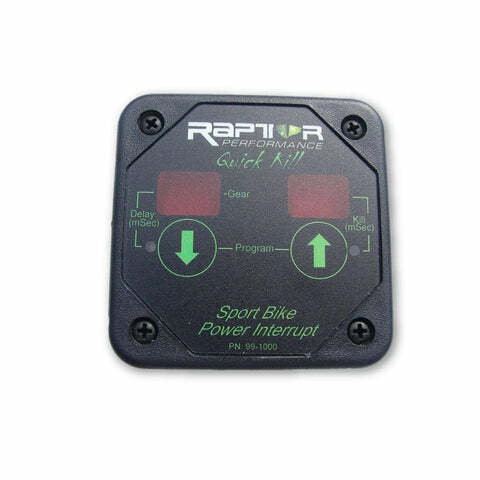 The all new Raptor Sport Bike, "Quick-Kill" fuel injection power interrupt. The Raptor " Quick-Kill ", allows for full throttle, clutch-less up shifts with an air shifter on motorcycles. The Quick-Kill interrupts or "kills" the fuel injectors for a split second, allowing the transmission to up shift effortlessly for smooth, quick shifts. Can be programmed with or without a gear position sensor. Bikes that are equipped with a analog (usually 3 wire) gear position sensor, can take advantage of programming the Quick-Kill with different kill times per gear. -All digital, microprocessor based design. No slow relays to wear out from arcing across contacts. -Controls 4 or 8 injectors. -Kill times are adjustable in 1 mSec (milli-second) increments from 0 mSec to 100 mSec. Having the ability to program 0 mSec is a benefit for bikes with auto transmissions that don't require kill times in the lower gears but may require some kill in the upper gears. -Delay time adjustment: once the shift is initiated, a programmable delay to allow time for the air solenoid to open and pressurize the air ram cylinder before the kill event occurs (from 0 mSec to 100 mSec). -Keypad and digital displays for easy adjustments. Allows programming of exact delay and kill times. -Delay and kill event LED indicators on keypad. -The Quick kill displays current gear and current kill time for that gear. -Initial setup "Learn mode" for setting up gear based bikes and learning gear position sensor voltages. Only need to do this once and values stored in memory for that bike. -Small size (2.5" L x 2.5" W) (0.9" height). -Non volatile memory (remembers settings when power is removed). -Can use horn button to initiate shift or use the Raptor Dual Mode Shift Light with Autoshift, to trigger the Quick Kill for Auto Shifting. -Electronics are potted for resistance to moisture and vibration.